Clogged Drain Line? Stopped-up Sewer Main? Call the emergency drain clearing experts at Art Rooter, Sewer & Drain Cleaning! We’ll clear any drain — Plus there’s NEVER an extra charge on weekends during regular business hours! Whether it’s roots in the sewer line, flushed objects, or broken drain lines, we have an experienced technician ready to handle it for you. Not only will we clear the stoppage, we can prevent it from reoccurring. We’ll also provide a video inspection of your main sewer line so you can see what’s going on down there. Your home’s drains often go unnoticed until a problem arises. Plumbing problems can range from being bothersome to disastrous. 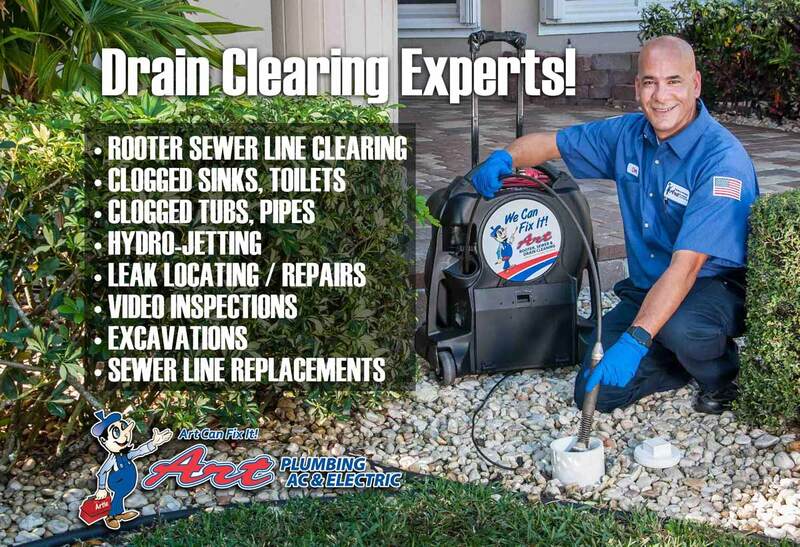 Whether you’re experiencing drain problems or you want to avoid problems in the future, consider professional drain clearing by Art Plumbing, AC & Electric. 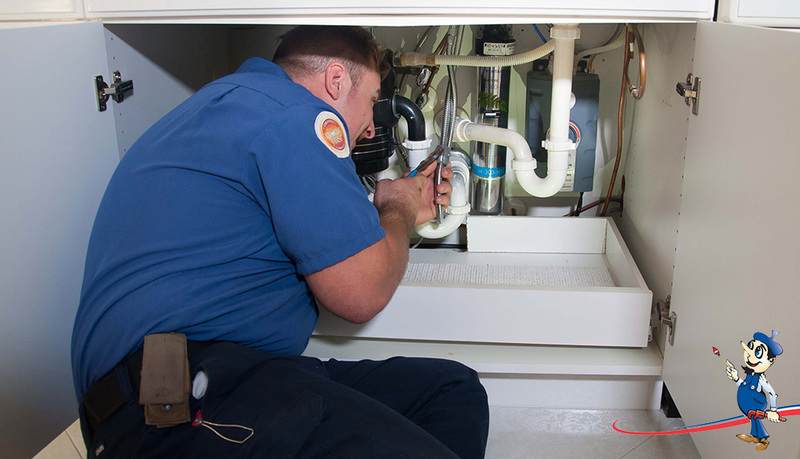 Our licensed plumbers have extensive training and experience in dealing with drainage issues of all types, so you can keep drainage issues, unnecessary expenses, and inconveniences at bay. Your 100% satisfaction is guaranteed! What are the indicators that you may need drain clearing? Slow drains. 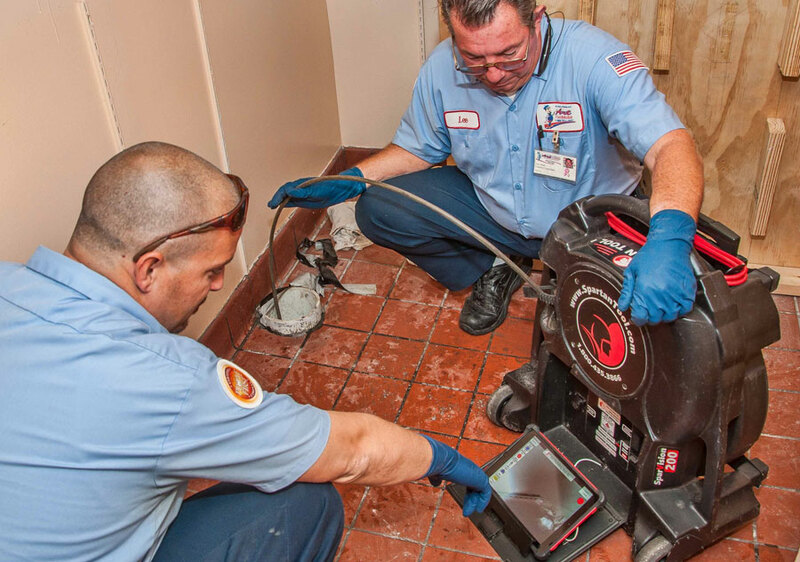 Experiencing slow drains are an indication of an impending clog, so don’t wait until you are dealing with a full-fledged clog before calling in our professionals. If you notice your sink or tub draining slowly, or water building up in the shower, your drains need attention. Slow drains may also indicate improper grading of your drainage system. Clogging. Recurring clogging, even after attempts to unclog, is a sign that the full clog is not being removed. Multiple clogged drains are indicative of a clog somewhere in the main drain system. A plunger cannot resolve this type of clog. Foul Odor. Pipes with buildup or a clog often emit an odor. This odor may be caused by grease, food, or sewage trapped within the pipe. The smell of sewage may be indicative of a much larger issue such as a broken pipe. Flooding. Experiencing flooding is a sign of a major clog in your drain. Backup from severely clogged drains could result in contaminated water in your home. What are some of the benefits of regular drain clearing? Prevents clogs and emergencies. Regular drain clearing keeps buildup from forming in your pipe, thereby reducing the risk of clogs, odors, leaks and flooding. Monitors condition of pipes. Professional plumbers employ a variety of tools to inspect your drains while they clean them. These inspections can catch early signs of pipe degradation and other issues that may arise before they become financial burdens. Prevents further damage. Chemical drain cleaners are hazardous to use and may cause damage to certain types of pipes. Leaving the drain clearing to the professionals keeps you and your pipes safe. Improved drain life. Clogs can cause a buildup in pressure in your plumbing, resulting in cracked or burst pipes. Drain clearing greatly decreases the risk of clogs, thereby improving the life of your pipes. How can you avoid clogs? Use sink strainers and mesh covers. These prevent unwanted items and debris from running down the drain. Clean them often to ensure proper function. Flush drains with hot water once a week. Hot water will help breakup any buildup from grease, food and soap that may be lining the walls of your pipes. Do not put food scraps or pour grease or oil down the drain. Drains are not meant to sustain those types of substances, eventually creating clogs. Do not flush heavy paper products. Excessive paper can clog toilets and the sewer system. Hydro jetting, sometimes called hydro scrubbing, uses water under high pressure to clean out drains and is the best method to remove stubborn clogs, sand, silt and scale build up. At approximately 4000 PSI, Hydro Jetting can cut through the toughest debris and stoppages. The problems Hydro Jetting solves include drains and pipes that continue to clog, and pipes that have particular spots where clogs can easily occur. This can be the result of tree roots that abound in a particular space. Hydro Jetting takes care of the problem completely and does not leave any remnant of a root behind. Hydro Jetting is safe to use and has the ability to restore drains to a like-new or scale-free state. Drains are completely cleaned following Hydro Jetting, making it a number one choice for resolving drainage issues. Some pipe cleaning methods may damage the interior of pipes, but Hydro Jetting uses a strong stream of water that propels the unit, leaving pipes undamaged. The water has taken care of the all the clogs and blockages that prevented the flow of water. Hydro Jetting can also be effective in resolving odor issues in drains with heavy debris or grease build-up, which is why it is frequently used in restaurants and commercial applications where grease, food waste or industrial debris is present. Foul odors and bacteria that can thrive in pipes and have the potential of making people feel sick. Art Plumbing, AC & Electric has used Hydro Jetting for a number of years, so we know how to use this powerful unit effectively within the pipes of your home, so call us to discuss your drain cleaning issues. Our experienced professionals will help you choose the method that’s right for your drain cleaning problem and budget. We’re here to help, and we’re always there when you need us! If you have a sewer drain problem that seems to re-occur periodically, we can help you get to the bottom of the problem by performing a video inspection of your sewer drains. We can tell you before someone starts digging up your yard if your problems are from a corroded, damaged or broken pipe, root growth, a stoppage in the line, or a foreign object clogging the pipe. Plus, we can determine the exact location of the problem. Our technicians perform hundreds of video inspections a year, giving Art Plumbing, AC & Electric unparalleled experience in the diagnosis of sewer and drain conditions. Our sophisticated equipment allows us to place a fiber optic video camera down your sewer line that then transmits video to our monitor above ground. We can see the type of problems, determine the exact location of the problem, and then quickly make the necessary repairs to have your plumbing working again as soon as possible. 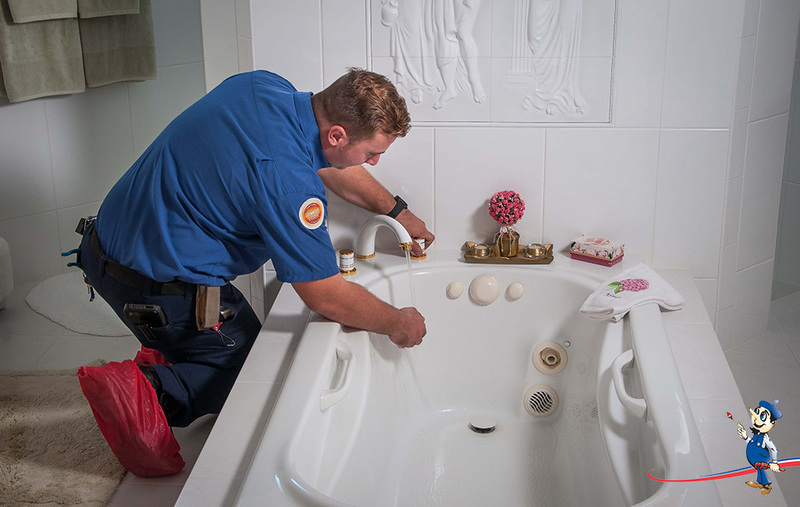 Whether it’s the shower, the bathtub or your sink, we can locate the clog and clear that stoppage. What are the indicators that you may need drain cleaning? What are some of the benefits of regular drain cleaning? Prevents clogs and emergencies. Regular drain cleaning keeps buildup from forming in your pipe, thereby reducing the risk of clogs, odors, leaks and flooding. Prevents further damage. Chemical drain cleaners are hazardous to use and may cause damage to certain types of pipes. Leaving the drain cleaning to the professionals keeps you and your pipes safe. Improved drain life. Clogs can cause a buildup in pressure in your plumbing, resulting in cracked or burst pipes. Drain cleaning greatly decreases the risk of clogs, thereby improving the life of your pipes. Clogged drains are never fun, but whatever you do, don’t reach for an over-the-counter, harsh, dangerous, liquid drain opener. These products are not only caustic and dangerous, but they can cause some serious damage to your plumbing system over time. 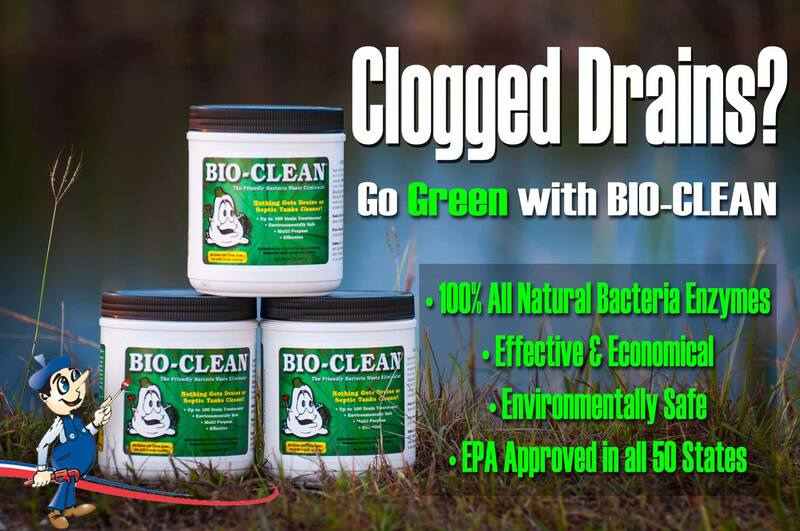 Since 1976, the plumbing industry nationwide has trusted Bioclean®, one of the only ACTUAL drain cleaners on the market. Bioclean is a mix of living enzymes and bacteria that thrive on things like hair, food particles, etc., and it’s harmless to humans and pets. The mix of bacteria in Bioclean is very similar to the bacteria found in your intestinal system, and instead of just opening a hole in the clog, the bacteria clings to the inner walls of your plumbing system and multiplies in this food rich environment. Within an hour after pouring the bacteria into the drain, the bacteria begin to eat their way into the waste that has accumulated on the sides and top of the drain pipe. This is their natural food. They digest the waste and spread throughout your system, cleaning it completely. Consistent use of Bioclean can take a problem plumbing system and make it a free flowing. For more information, or to get your supply of Bioclean, Call Art Plumbing, AC & Electric today!